Uncover the truth with Funko Pop Uncharted. The stylized release features Naughty Dog's main character from the video game franchise. In the action-adventure game series Uncharted, Nathan Drake is a "treasure hunter" who appears and acts much like Indiana Jones. 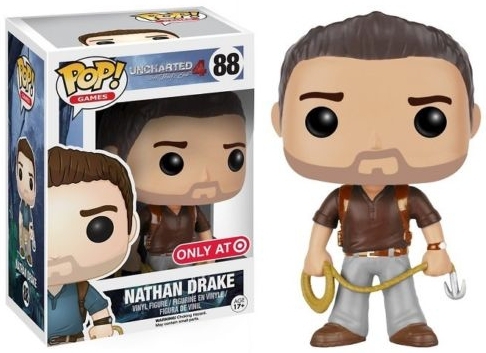 Funko Pop Uncharted offers the sarcastic explorer in a blue shirt and khakis. Despite his travels, Drake somehow manages to keep his brown hair exceptionally well-groomed. 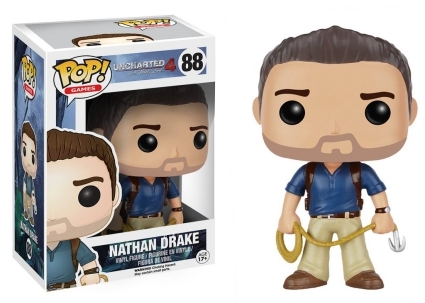 Shop for Pop Uncharted Figures on Amazon. Naturally included in the Pop! Games line, Funko Pop Uncharted also gives fans exclusive variants from Uncharted 4: A Thief's End. Nathan Drake wearing gray pants and a brown shirt with a corresponding watch is issued through Target. Meanwhile, only 5,000 figures were produced for Drake in a black shirt featuring the Naughty Dog logo (which is a red paw print). This limited figure is a GameStop/EB Games exclusive. Funko Pop! Games Uncharted 4 Nathan Drake #88 Target Exclusive WITH PROTECTOR!